V7 II Racer completes the V7 II range, boasting a completely new stunning graphic. 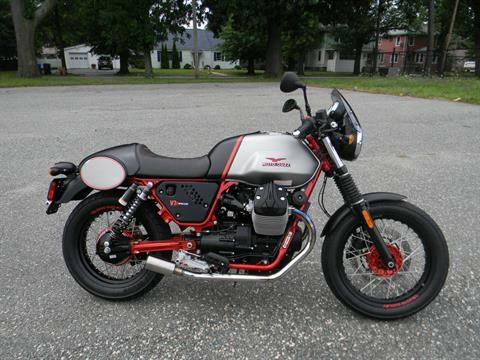 Moto Guzzi Centro Stile has exclusively developed this graphic for the North American market; as a result this graphic carries the evocative “Racer America” name. This special model is manufactured in Limited Edition (1 / 1,000) as indicated by the celebratory aluminum plate located on the upper steering yoke. V7 II is now safer thanks to the standard dual channel Continental ABS system and traction control (Moto Guzzi Controllo Trazione) and more enjoyable to ride thanks to a new 6-speed gearbox. 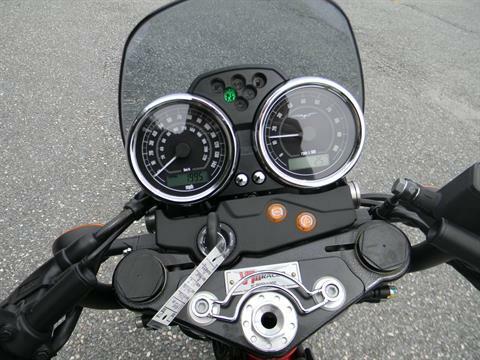 The revised engine position and improved ergonomics have greatly enhanced riding comfort. Seat is now lower at 31.1 inches (790 mm) as opposed to the previous 31.6 inches (805 mm), also the footpegs have been lowered to make room for taller riders. 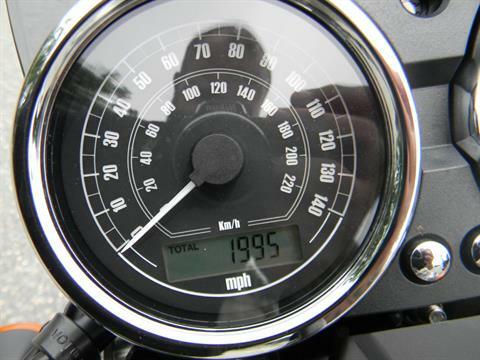 The new riding position lets the rider enjoy the full benefits of the changes that have been made to the chassis which have made the front end more precise and efficient. 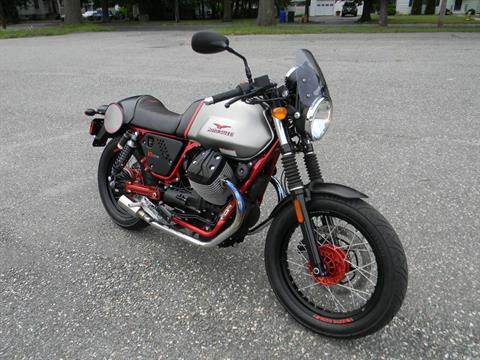 All these improvements contribute to fully meet expectations in terms of aesthetics and riding pleasure. For the first time the Racer will be produced with a satin finished tank, the Black / Metallic Gray paints are matched at an angle emphasized by a red line that is virtually a continuation of the distinctive V7 Racer red frame. In search for a more understated look the “7” has been eliminated from the number plates which now have a satin finish like the mudguards. The total-black look on the side panels, mirrors, silencer brackets and footpeg guards, first introduced on MY15. 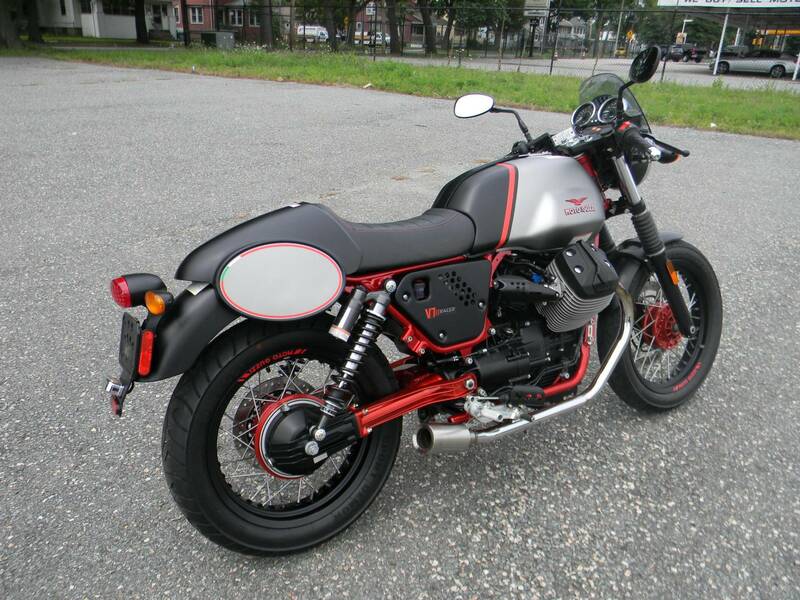 The tank belt and saddle are black, padding has been added to the seat to improve comfort, red stitching with and embroidered Moto Guzzi eagle completes the retro style. This new V7 II Racer is all about the details, and new brake and clutch levers, have been redesigned in order to achieve better ergonomics. One of the most distinctive features of this special-edition is the widespread use of anodized matte black and drilled aluminum. 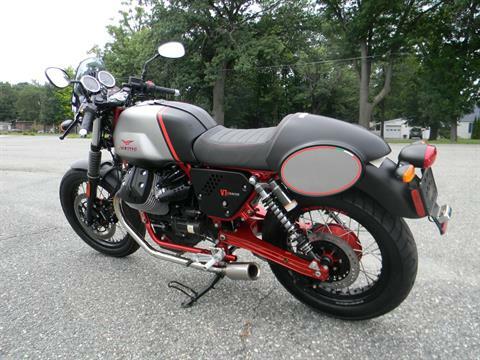 This hand-crafted treatment, which requires superb artisan skill, characterizes the side panels, the throttle body guards and the silencer mounting brackets. Other premium components include the aft-mounted footpegs machined from solid billets, the lightened steering stem and the steering yoke guard consisting of a double-chromed ring, which is so exquisitely crafted that it looks like an ornamental feature. A particularly gratifying feature, not only in terms of aesthetics, but also because of their dynamic performance, is the presence of Bitubo WMY01 shock absorbers with spring preload adjustment in rebound and compression thanks to a twelve-setting adjustment knob. The endless details of this special bike will be appreciated by each one of its owners who will likely ride it one-up, in black leathers. This new model in the historic V7 range is trendy, agile, easy to customize with an array of accessories and features including the new 750 cc, 90-degree V-twin engine that is more powerful and stays true to the characteristics of the Moto Guzzi tradition, that touring on a motorcycle at its most pure should be nothing but enjoyable. 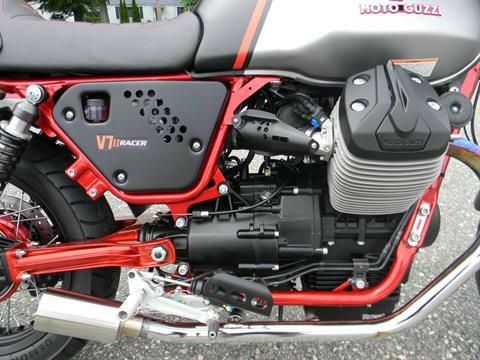 The completely re-engineered engine still relies on the engineering that made the Moto Guzzi V750 a success among riders in 1977. Since then the engine has been continuously updated yet stays faithful to the original genial layout introduced by Italian engineer Lino Tonti in the 70s. 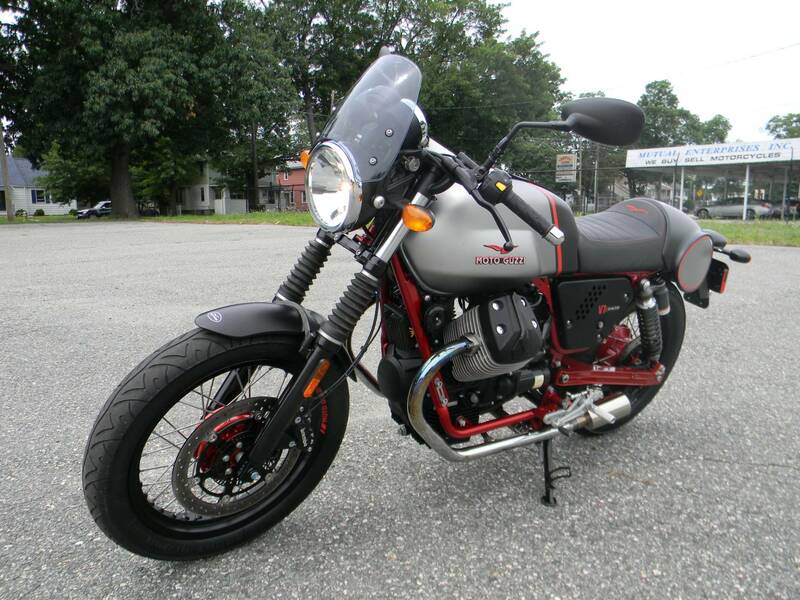 While maintaining the classic transversal 90-degree V-twin configuration, the engine is now comprised of more than 70 percent&nbsp;new components. Cutting-edge technological solutions improve functionality, provide greater torque and power even at low rpms, and make the V7 more efficient, with higher fuel economy and reduced emissions. The Moto Guzzi V7 II Racer ABS, prestigiously manufactured in the iconic Mandello Del Lario (Italy) factory, is now available in U.S. dealerships. 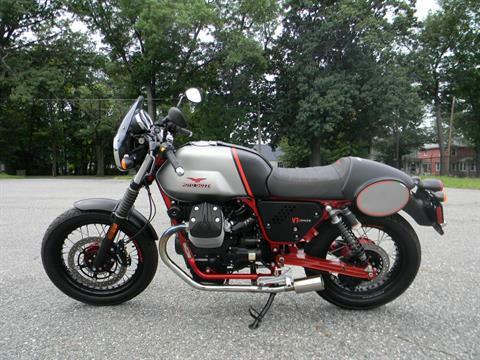 As with all of Moto Guzzi’s on-road motorcycles, the V7 II Racer ABS comes with&nbsp;Roadside Assistance for one year.